Zc379. 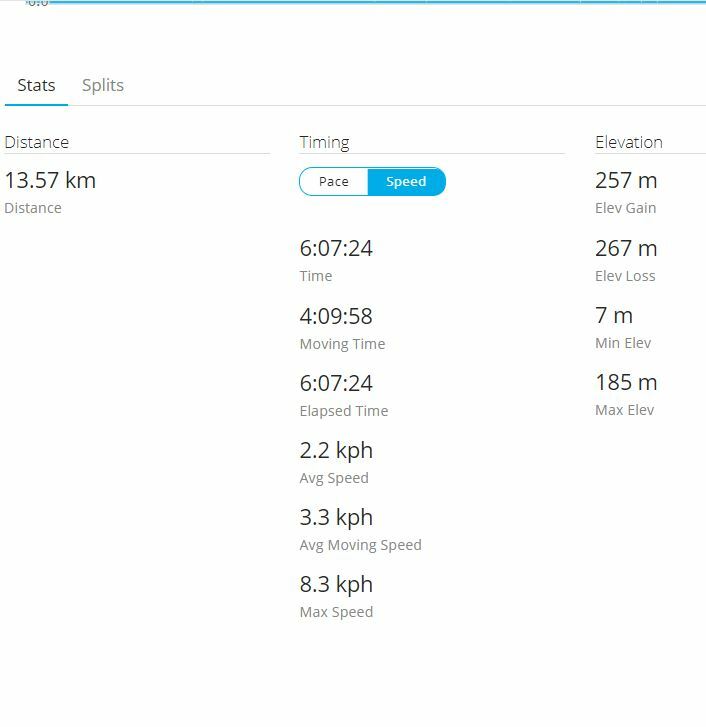 My Garmin device data and tracks of my walk to Battery Cheney on Corregidor Island, the former Fort Mills, in the Manila Bay Harbor Defense Command, 1 of 4 images shot 2018-07-06. 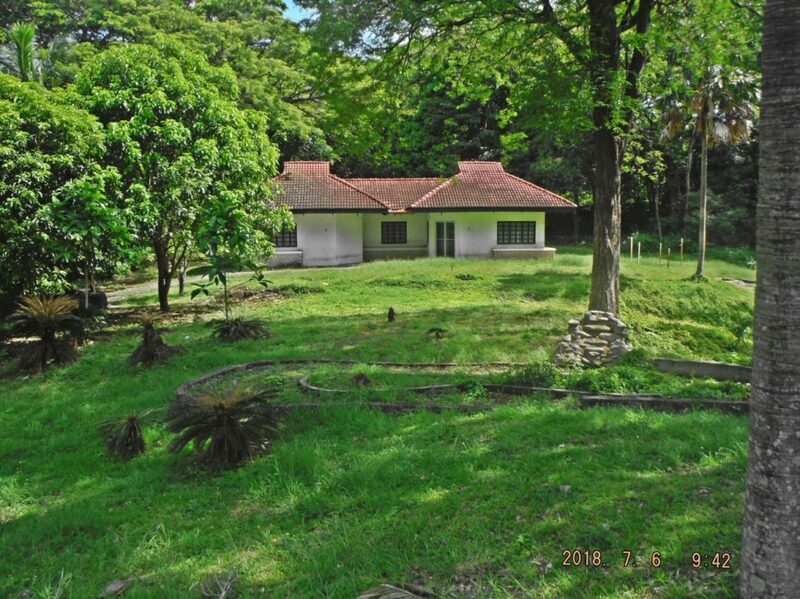 I visited Corregidor 2018-07-06 to 08 to see what is happening on Corregidor under the new Corregidor Foundation Inc. (CFI) management. But I was also able to get two walks in; this is my first one, from Bottomside to Battery Cheney and back. Zc380. 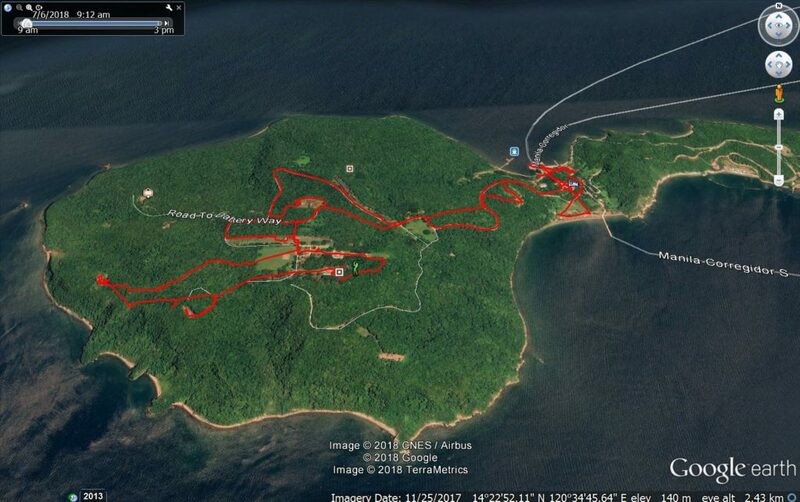 My Garmin device data and tracks of my walk to Battery Cheney on Corregidor Island, the former Fort Mills, in the Manila Bay Harbor Defense Command, 1 of 4 images shot 2018-07-06. Zc381. My Garmin device data and tracks of my walk to Battery Cheney on Corregidor Island, the former Fort Mills, in the Manila Bay Harbor Defense Command, 1 of 4 images shot 2018-07-06. Zc382. My Garmin device data and tracks of my walk to Battery Cheney on Corregidor Island, the former Fort Mills, in the Manila Bay Harbor Defense Command, 1 of 4 images shot 2018-07-06. Zc383. 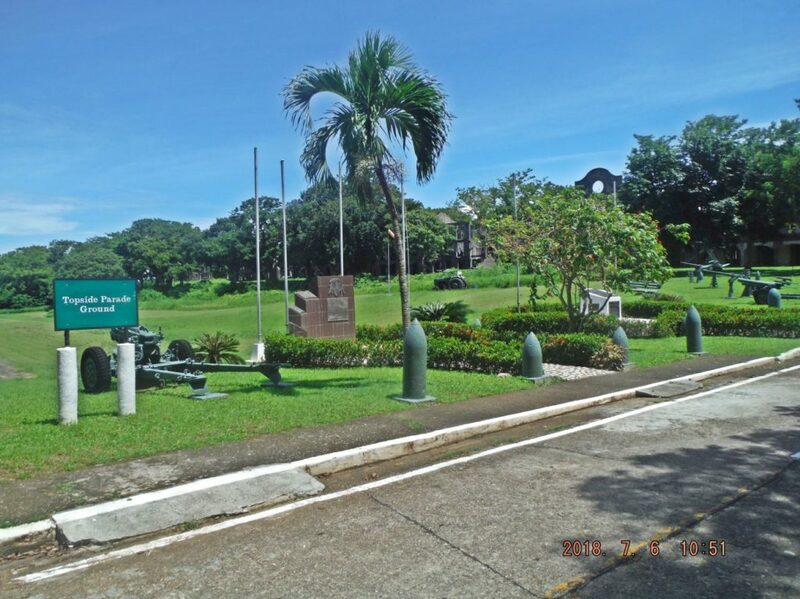 0ne of eight images of my walk from Bottomside up to Middleside on Corregidor Island, the former Fort Mills in WWII, 2018-07-06, this is the entrance to the Memorial Site. Zc384. 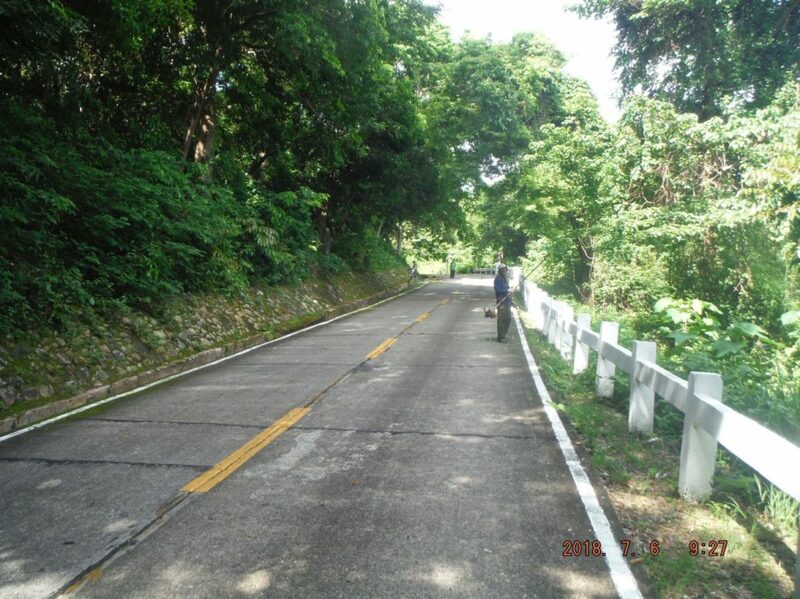 0ne of eight images of my walk from Bottomside up to Middleside on Corregidor Island, the former Fort Mills in WWII, 2018-07-06, this is street maintenance team at work as always. Zc385. 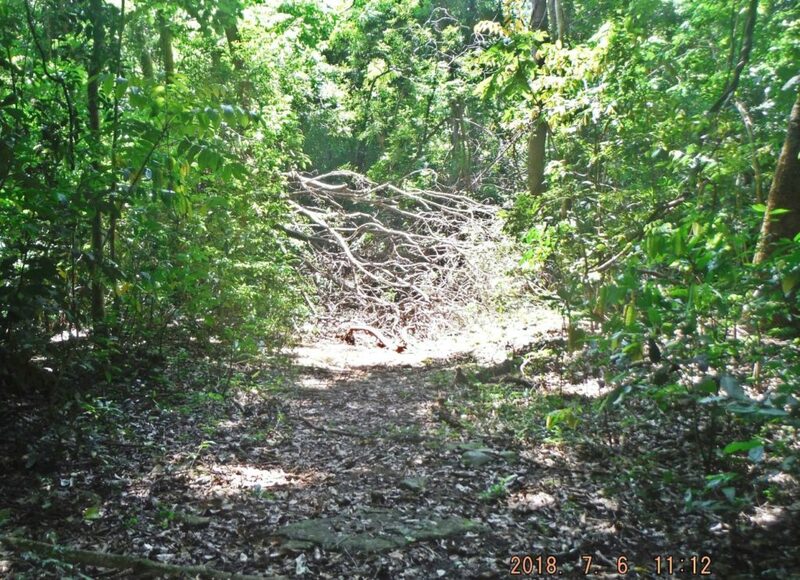 0ne of eight images of my walk from Bottomside up to Middleside on Corregidor Island, the former Fort Mills in WWII, 2018-07-06, this is the entrance to Stockade Level. Zc386. 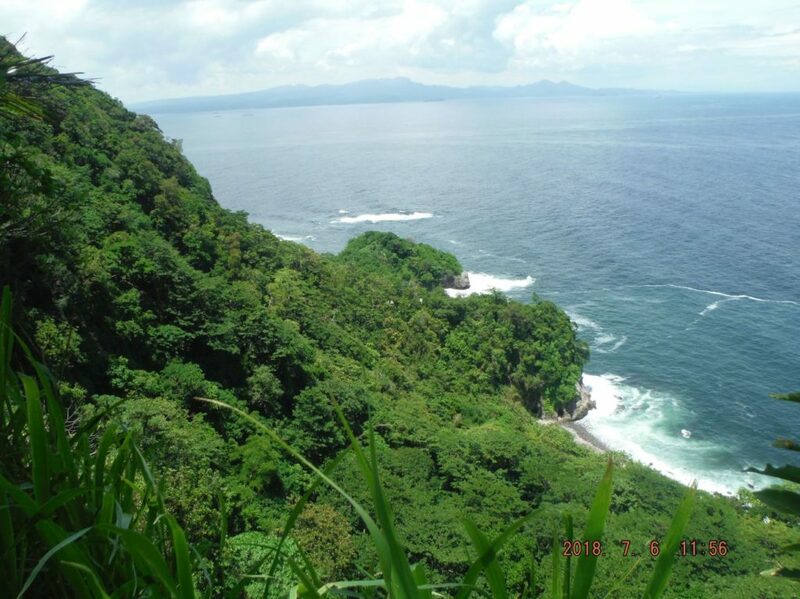 One of eight images of my walk from Bottomside up to Middleside on Corregidor Island, the former Fort Mills in WWII, 2018-07-06, this is Carabao Island, Fort Frank in view. Zc387. 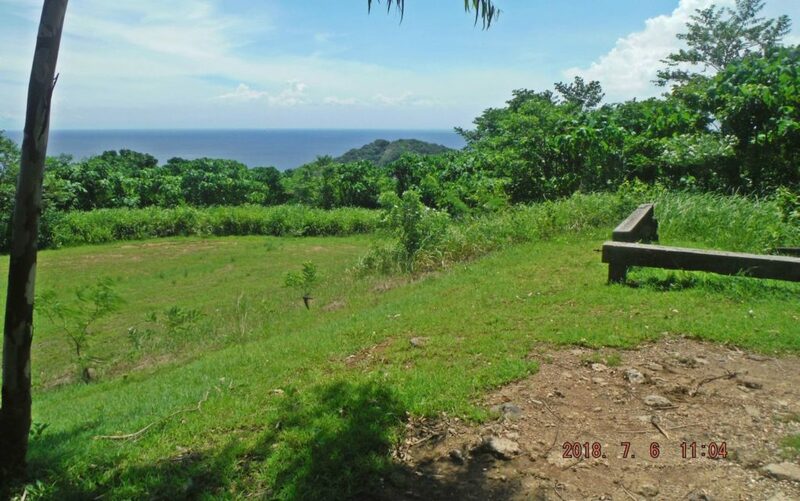 0ne of eight images of my walk from Bottomside up to Middleside on Corregidor Island, the former Fort Mills in WWII, 2018-07-06, this is El Fraile Island, Fort Drum in view. Zc388. 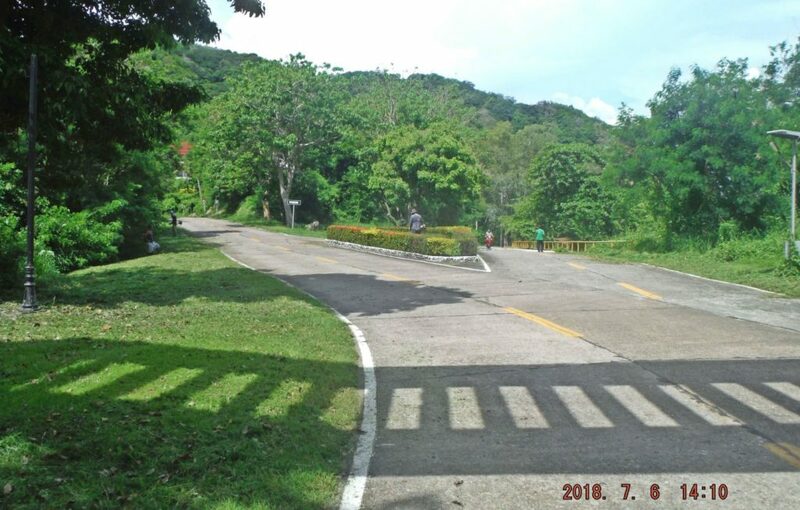 0ne of eight images of my walk from Bottomside up to Middleside on Corregidor Island, the former Fort Mills in WWII, 2018-07-06, this is the entrance to Middleside. Zc389. 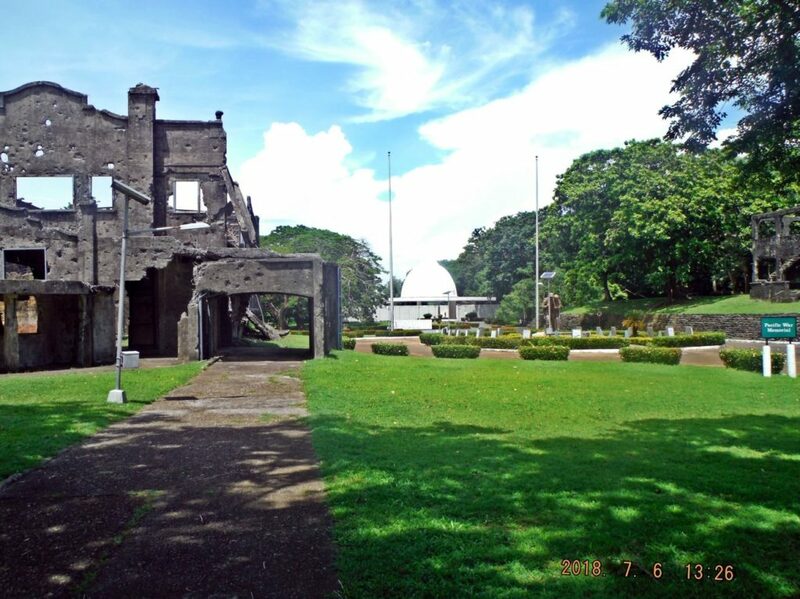 0ne of eight images of my walk from Bottomside up to Middleside on Corregidor Island, the former Fort Mills in WWII, 2018-07-06, this is the former Aviary and then Kwiecinski Family residence, they have returned to the US. Zc390. 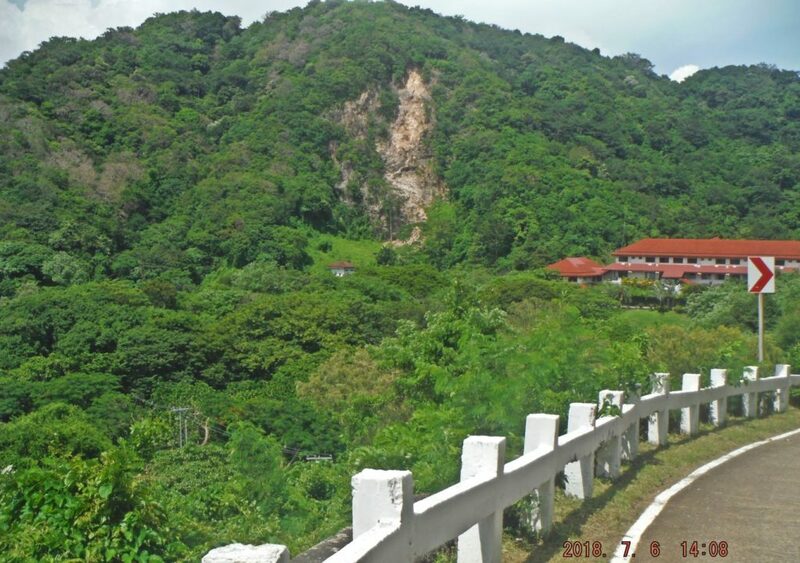 0ne of eight images of my walk from Bottomside up to Middleside on Corregidor Island, the former Fort Mills in WWII, 2018-07-06, this is the view to the YMCA but one cannot see it because of the growing trees. Zc391. 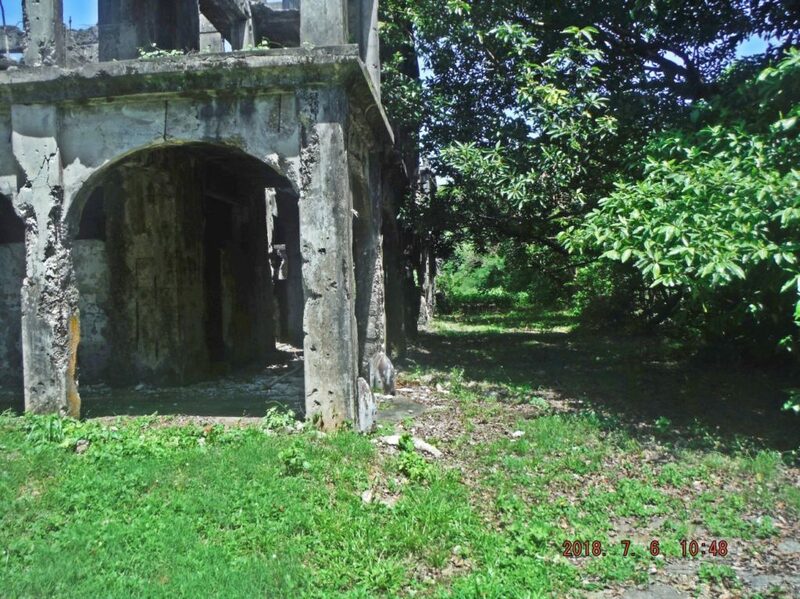 0ne of five images of my walk from Bottomside up to Battery Cheney on Corregidor Island, the former Fort Mills in WWII, 2018-07-06, this is the more southern Middle Side Barracks. Zc392. 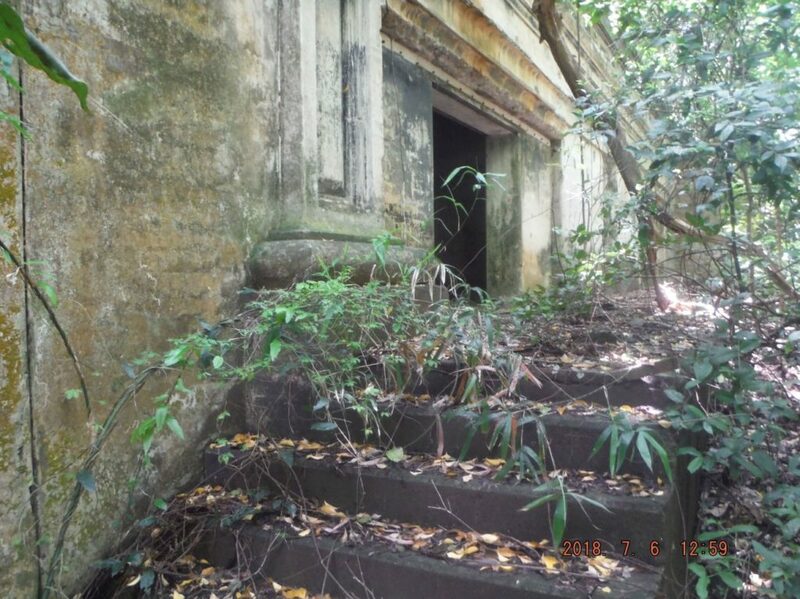 0ne of five images of my walk from Bottomside up to Battery Cheney on Corregidor Island, the former Fort Mills in WWII, 2018-07-06, this is the more southern Middle Side Barracks. Zc393. 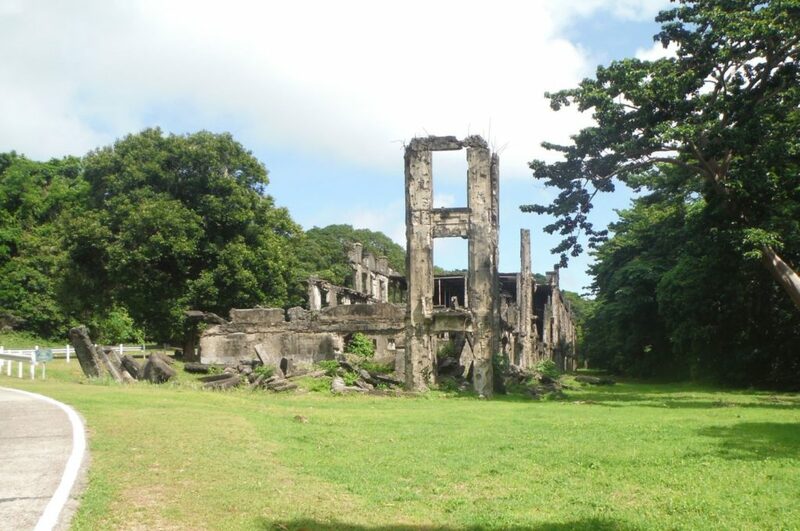 0ne of five images of my walk from Bottomside up to Battery Cheney on Corregidor Island, the former Fort Mills in WWII, 2018-07-06, this is the more northern Middle Side Barracks. Zc394. 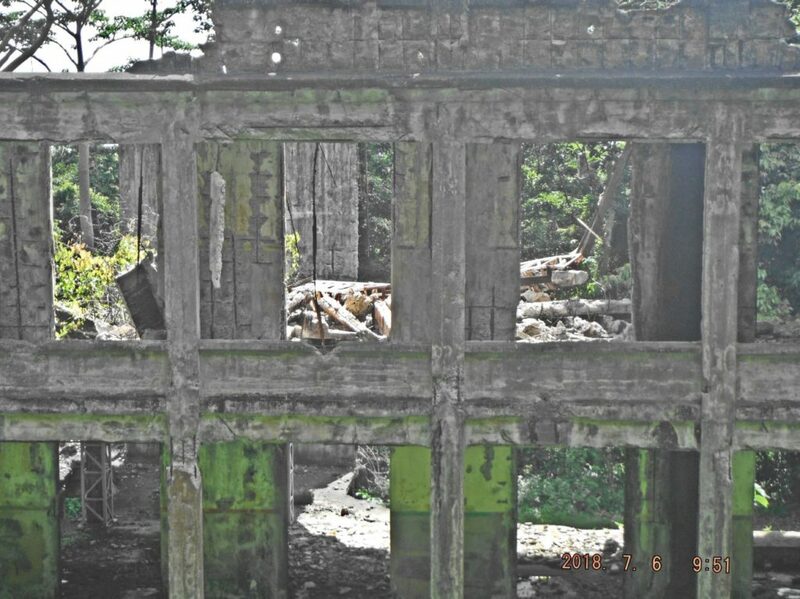 0ne of five images of my walk from Bottomside up to Battery Cheney on Corregidor Island, the former Fort Mills in WWII, 2018-07-06, this is the more northern Middle Side Barracks. 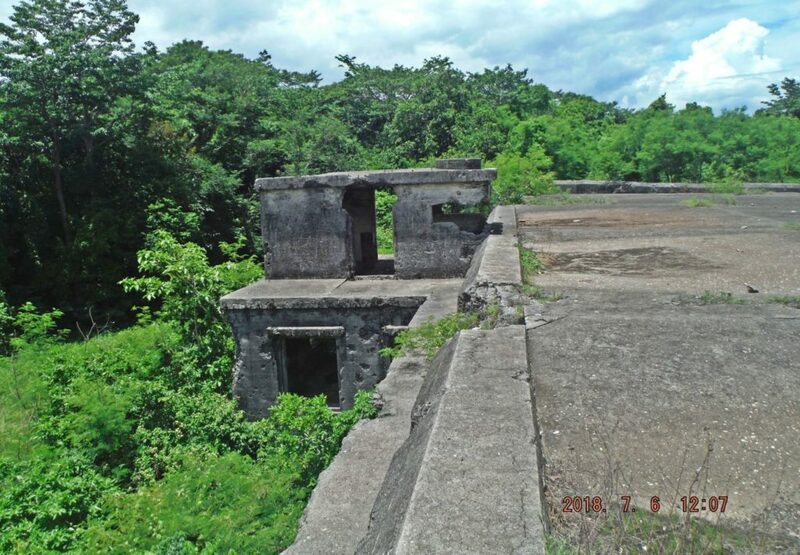 Zc395.0ne of five images of my walk from Bottomside up to Battery Cheney on Corregidor Island, the former Fort Mills in WWII, 2018-07-06, this is the more northern Middle Side Barracks. Zc396. 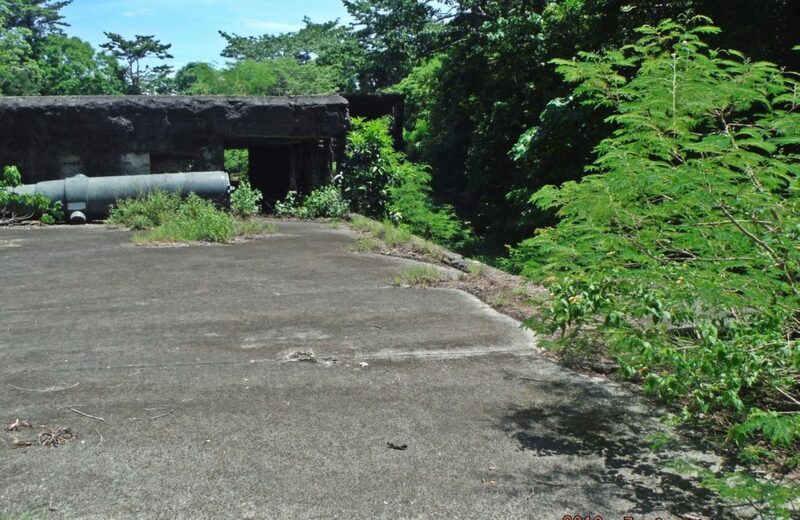 0n my walk from Bottomside up to Battery Cheney on Corregidor Island, the former Fort Mills in WWII, 2018-07-06, this is Battery Way. Zc397. 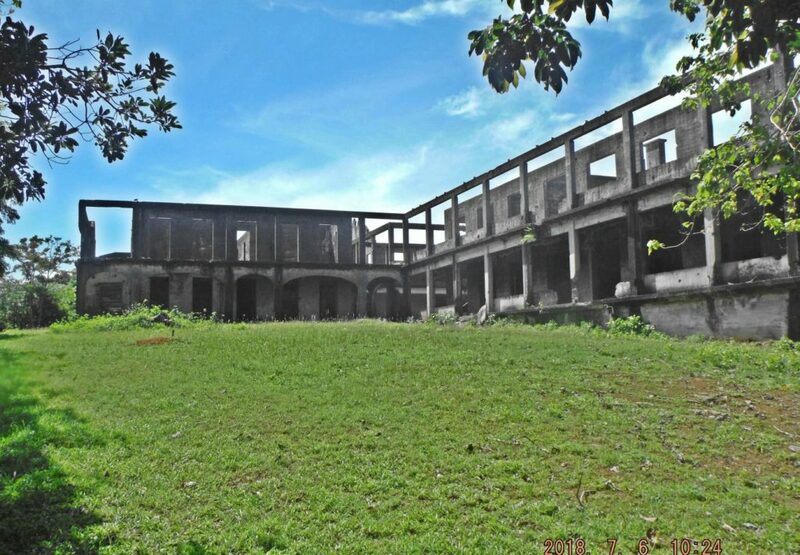 0ne of three images of my walk from Bottomside up to Battery Cheney on Corregidor Island, the former Fort Mills in WWII, 2018-07-06, this is the Hospital at Middleside. Zc398. 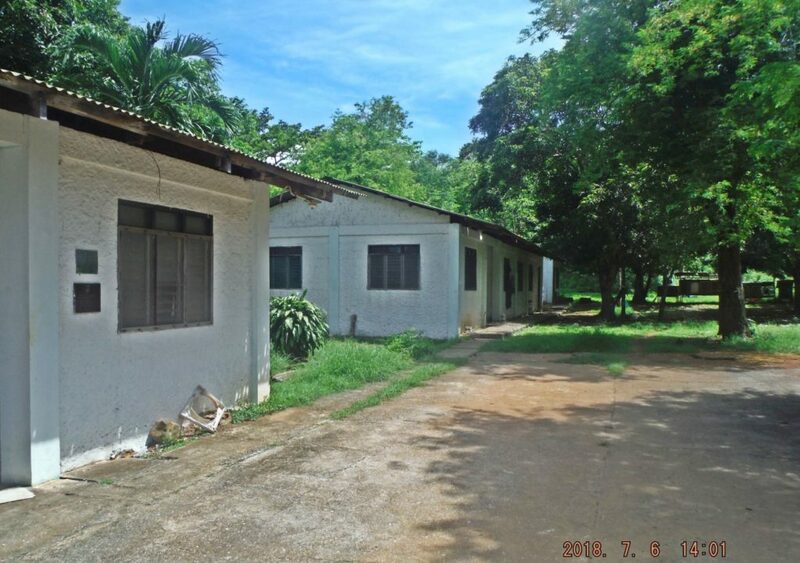 0ne of three images of my walk from Bottomside up to Battery Cheney on Corregidor Island, the former Fort Mills in WWII, 2018-07-06, this is the Hospital at Middleside. Zc399. 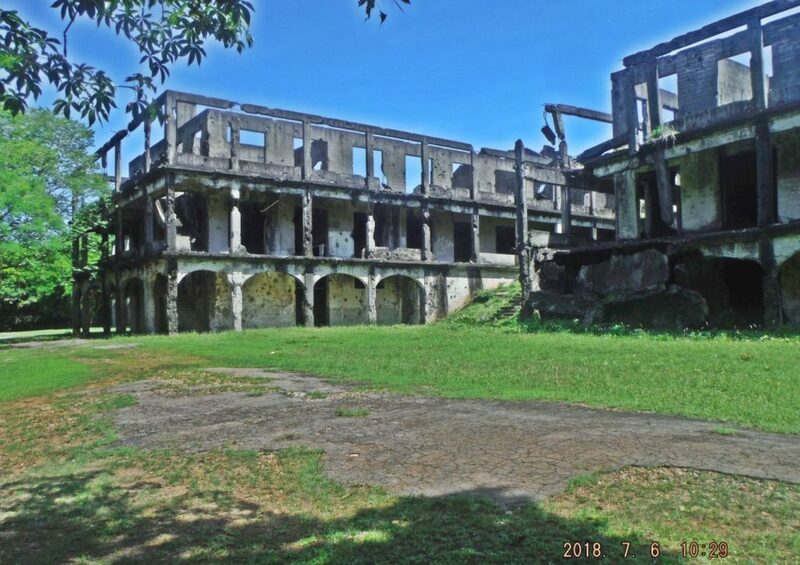 0ne of three images of my walk from Bottomside up to Battery Cheney on Corregidor Island, the former Fort Mills in WWII, 2018-07-06, this is the Hospital at Middleside. Zc400. 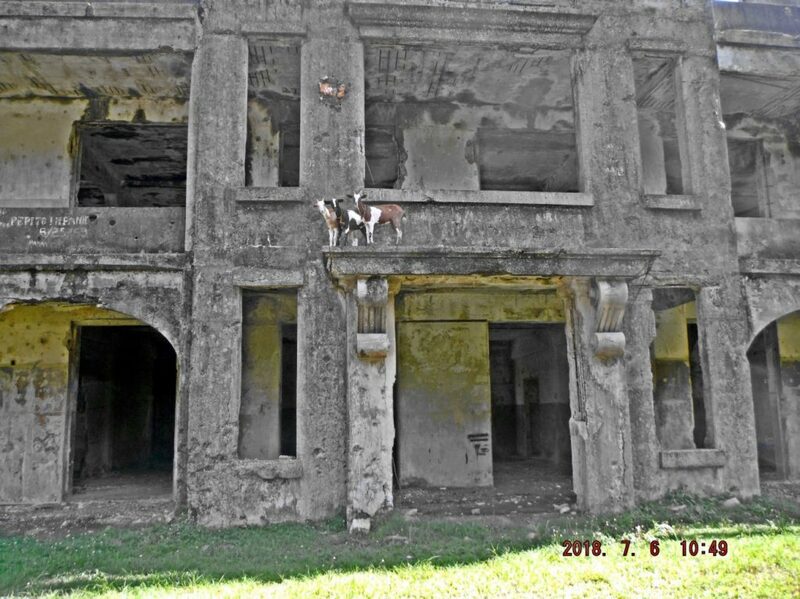 0ne images of my walk from Bottomside up to Battery Cheney on Corregidor Island, the former Fort Mills in WWII, 2018-07-06, this is the Commissary at Middleside. Zc401. 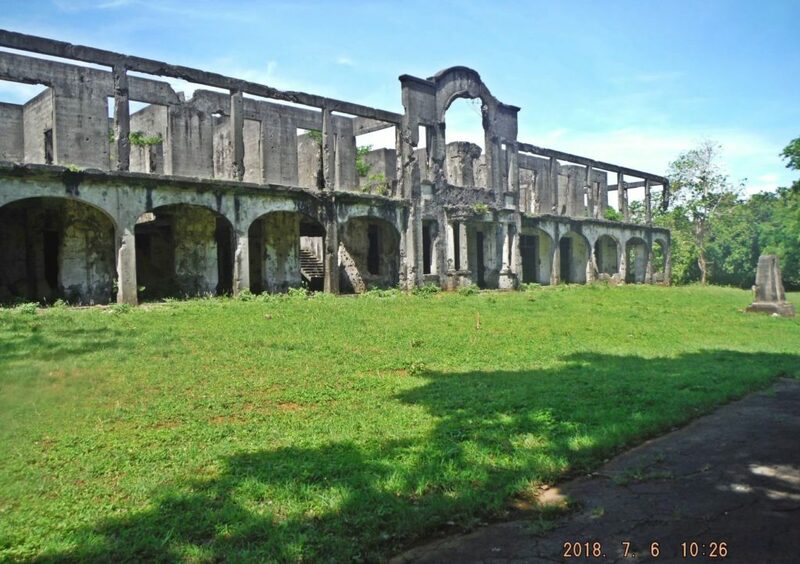 0ne of four images of my walk from Bottomside up to Battery Cheney on Corregidor Island, the former Fort Mills in WWII, 2018-07-06, this is the Topside Barracks (aka Mile Long Barracks). There is blockage on the north side. Zc402. 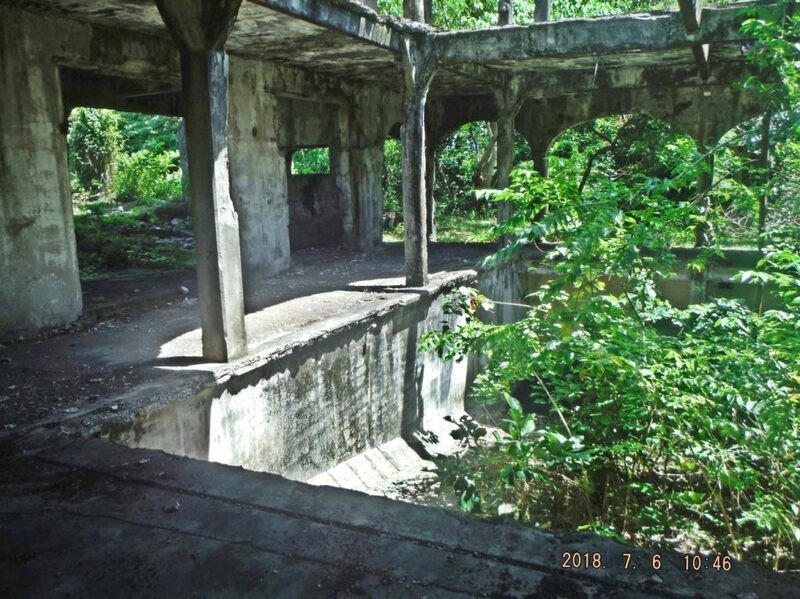 0ne of four images of my walk from Bottomside up to Battery Cheney on Corregidor Island, the former Fort Mills in WWII, 2018-07-06, this is the Topside Barracks (aka Mile Long Barracks). There is blockage on the north side. Zc403. 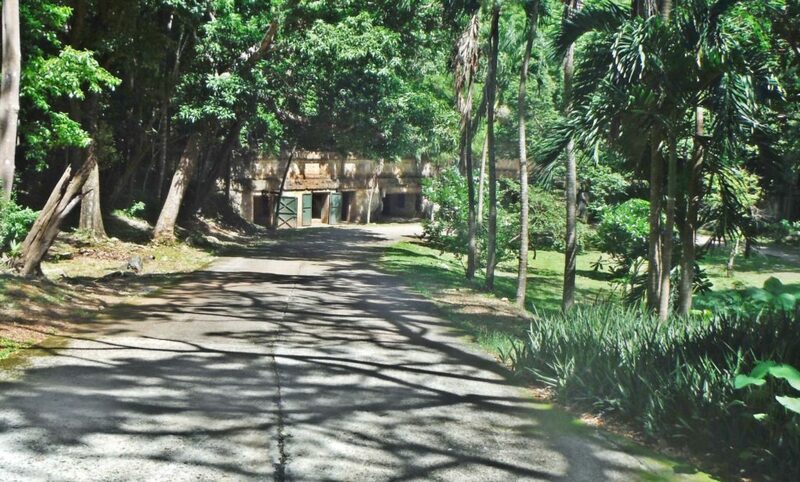 0ne of four images of my walk from Bottomside up to Battery Cheney on Corregidor Island, the former Fort Mills in WWII, 2018-07-06, this is the Topside Barracks (aka Mile Long Barracks). There is blockage on the north side. Zc404. 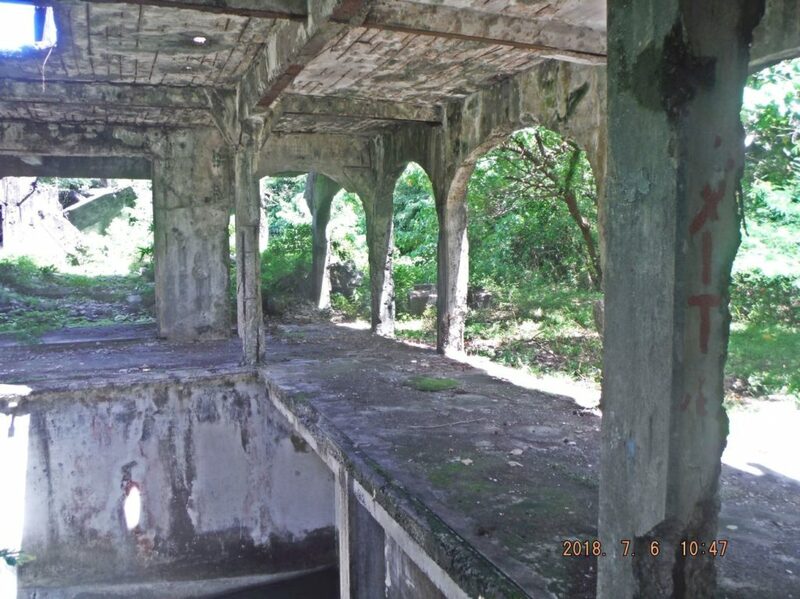 0ne of four images of my walk from Bottomside up to Battery Cheney on Corregidor Island, the former Fort Mills in WWII, 2018-07-06, this is the Topside Barracks (aka Mile Long Barracks). There is blockage on the north side. How did the goats get there, how are they getting down? 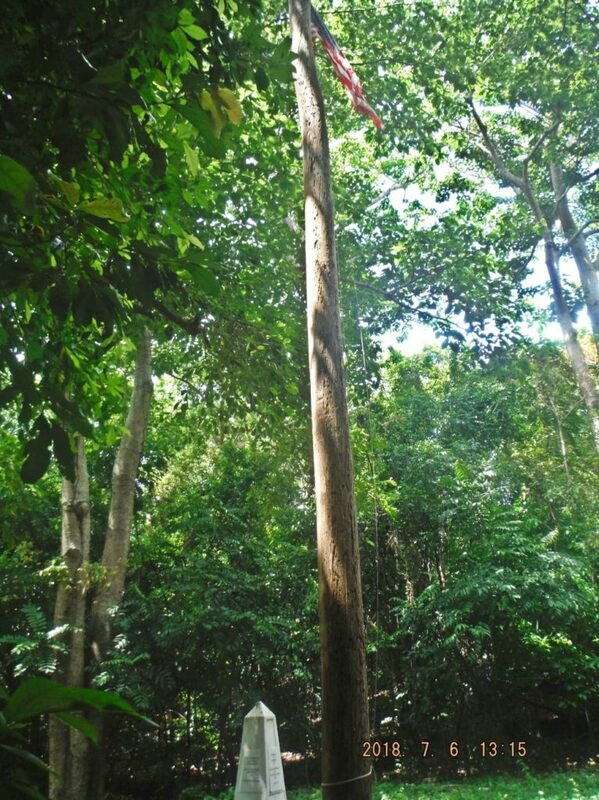 Zc405. 0n my walk from Bottomside up to Battery Cheney on Corregidor Island, the former Fort Mills in WWII, 2018-07-06, this is the Rock Forth with the Texas University Memorials, the flags were not flown during my visit. Zc406. 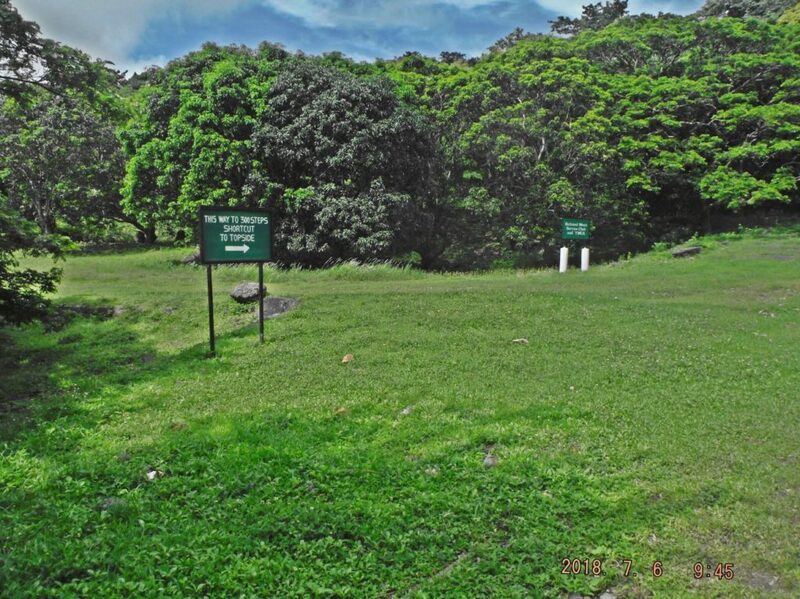 0ne of five images of my walk from Bottomside up to Battery Cheney on Corregidor Island, the former Fort Mills in WWII, 2018-07-06, this is the Pacific War Memorial area, the flags were not up even though it is a general visit day. Zc407. 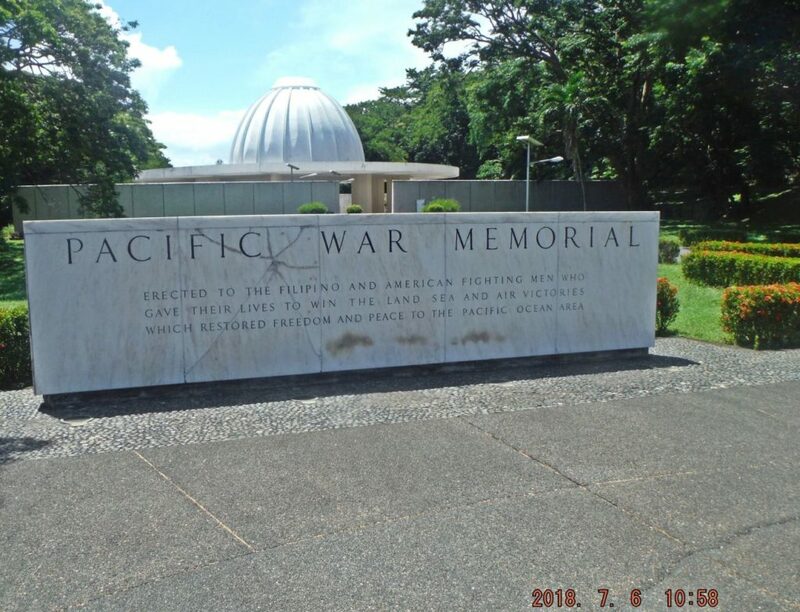 0ne of five images of my walk from Bottomside up to Battery Cheney on Corregidor Island, the former Fort Mills in WWII, 2018-07-06, this is the Pacific War Memorial area, the flags were not up even though it is a general visit day. Zc408. 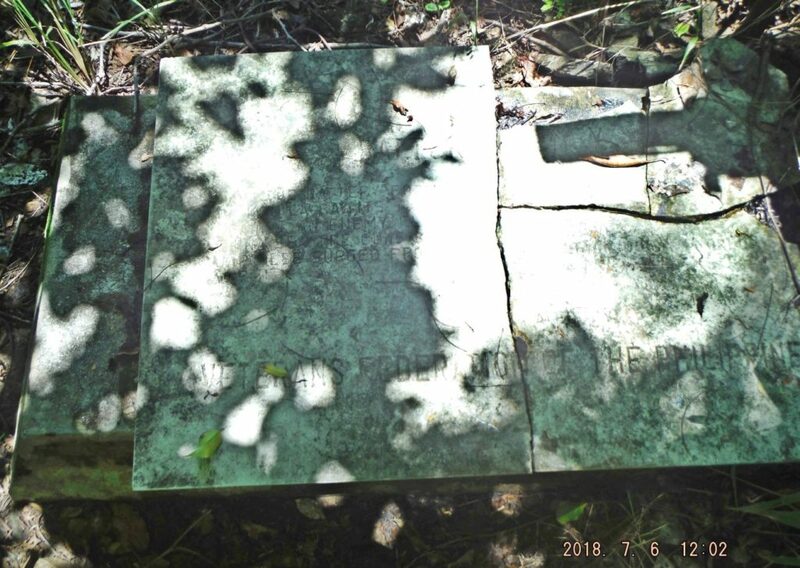 0ne of five images of my walk from Bottomside up to Battery Cheney on Corregidor Island, the former Fort Mills in WWII, 2018-07-06, this is the Pacific War Memorial area, I never noticed the crack before. Zc409. 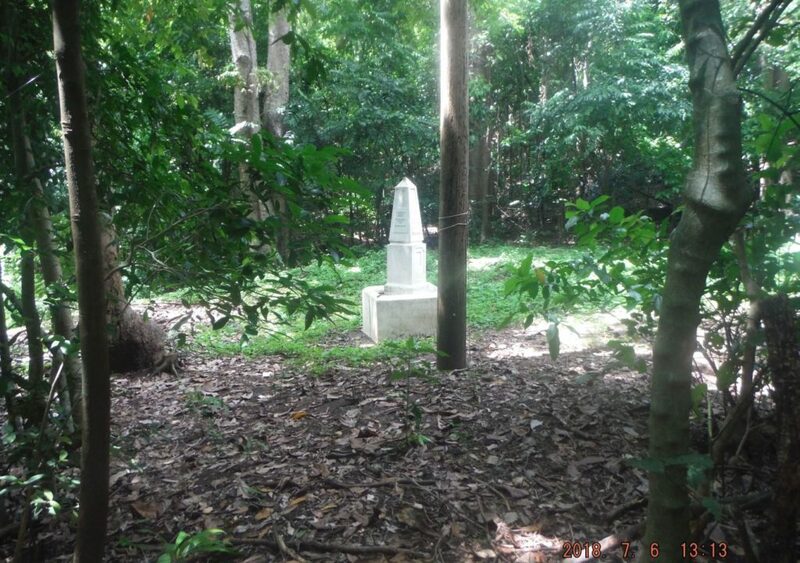 0ne of five images of my walk from Bottomside up to Battery Cheney on Corregidor Island, the former Fort Mills in WWII, 2018-07-06, this is the Pacific War Memorial area. Zc410. 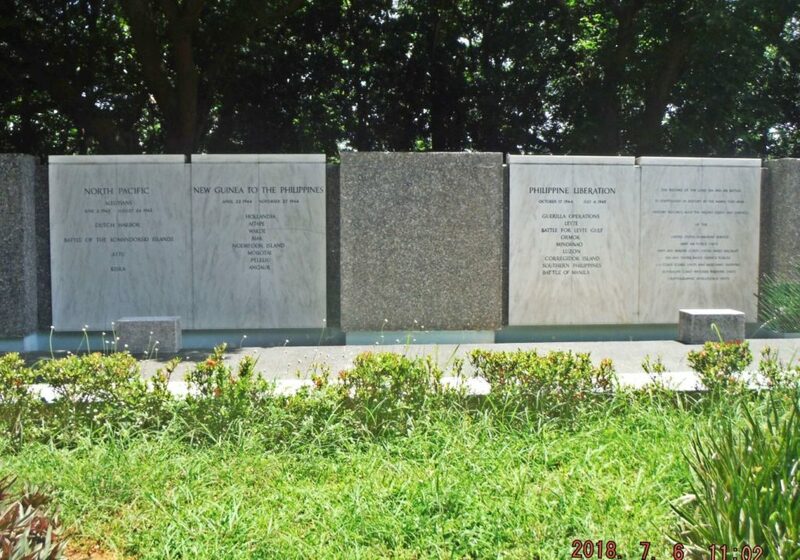 0ne of five images of my walk from Bottomside up to Battery Cheney on Corregidor Island, the former Fort Mills in WWII, 2018-07-06, this is the VERY SPECIAL PLACE TO REMEMBER, TOM ARING (PHANTOM), HIS ASHES LIE HERE. Zc411. 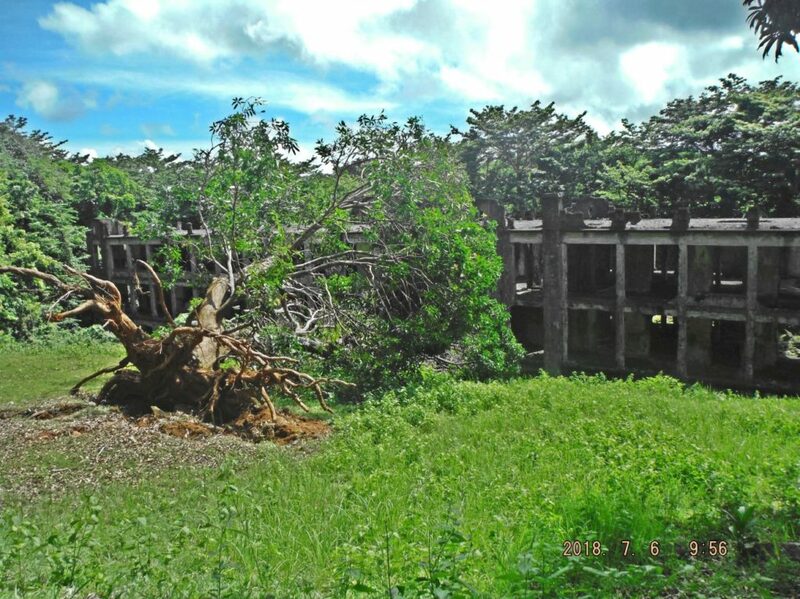 0n my walk from Bottomside up to Battery Cheney on Corregidor Island, the former Fort Mills in WWII, 2018-07-06, a tree is down at the Senior Officer Quarters Topside, at the east section. Zc412. 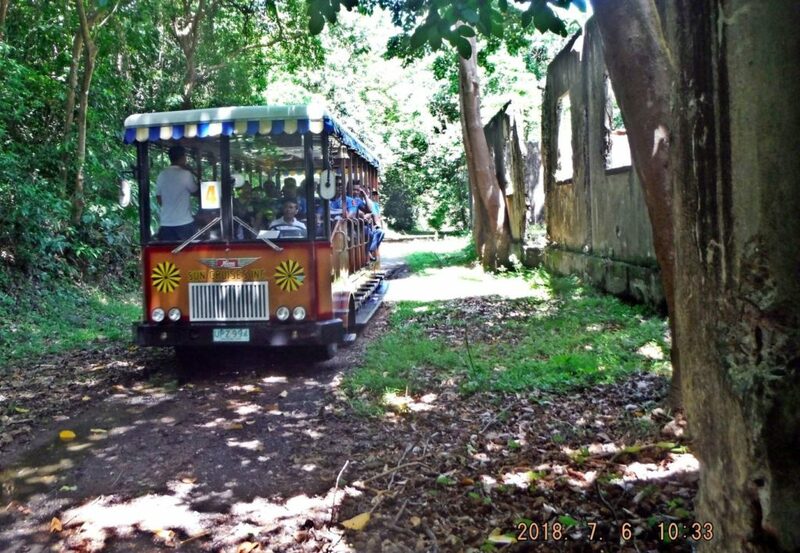 0ne of five images of my walk from Bottomside up to Battery Cheney on Corregidor Island, the former Fort Mills in WWII, 2018-07-06, this is Battery Wheeler, a 12 Inch battery. Zc413. 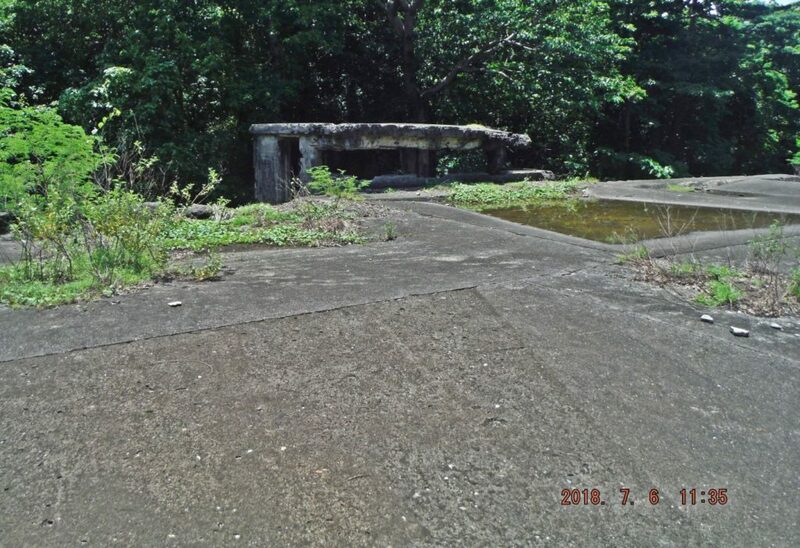 0ne of five images of my walk from Bottomside up to Battery Cheney on Corregidor Island, the former Fort Mills in WWII, 2018-07-06, this is Battery Wheeler, a 12 Inch battery. Zc414. 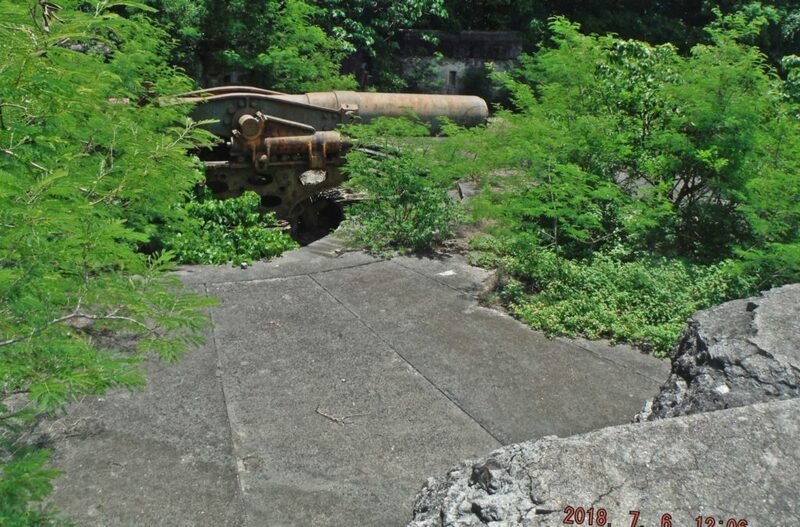 0ne of five images of my walk from Bottomside up to Battery Cheney on Corregidor Island, the former Fort Mills in WWII, 2018-07-06, this is Battery Wheeler, a 12 Inch battery. Zc415. 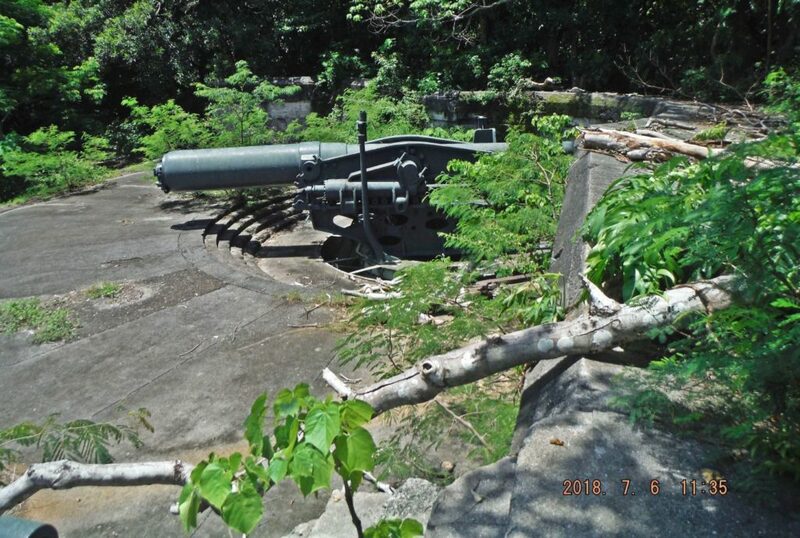 0ne of five images of my walk from Bottomside up to Battery Cheney on Corregidor Island, the former Fort Mills in WWII, 2018-07-06, this is Battery Wheeler, a 12 Inch battery. Zc416. 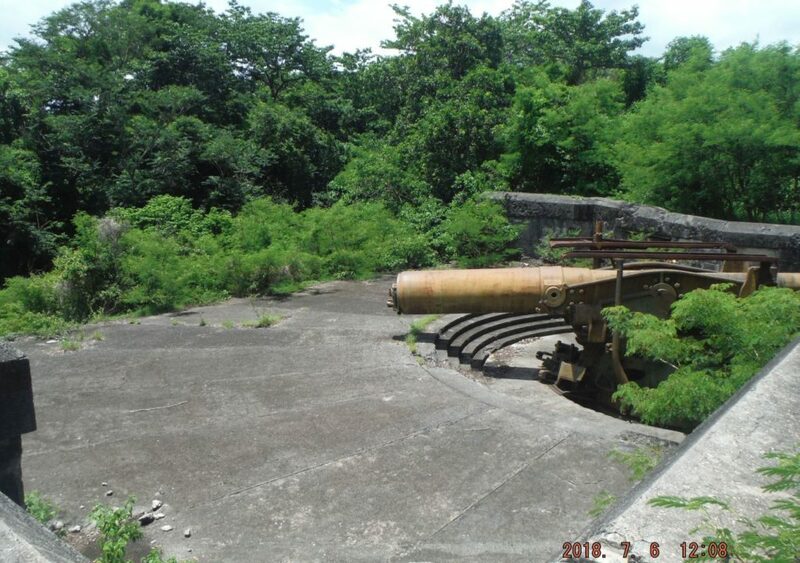 0ne of five images of my walk from Bottomside up to Battery Cheney on Corregidor Island, the former Fort Mills in WWII, 2018-07-06, this is Battery Wheeler, a 12 Inch battery. Zc417. 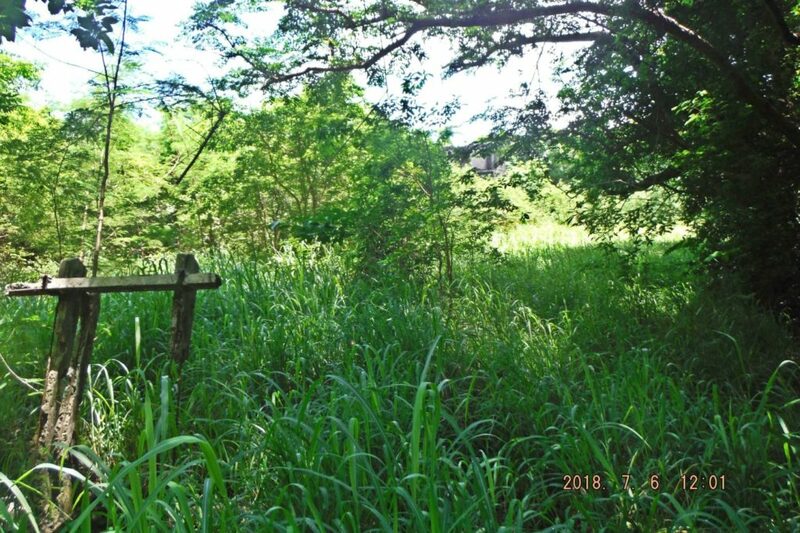 0ne of three images of my walk from Bottomside up to Battery Cheney on Corregidor Island, the former Fort Mills in WWII, 2018-07-06, this is the shoreline between Wheeler and Searchlight Points. Zc418. 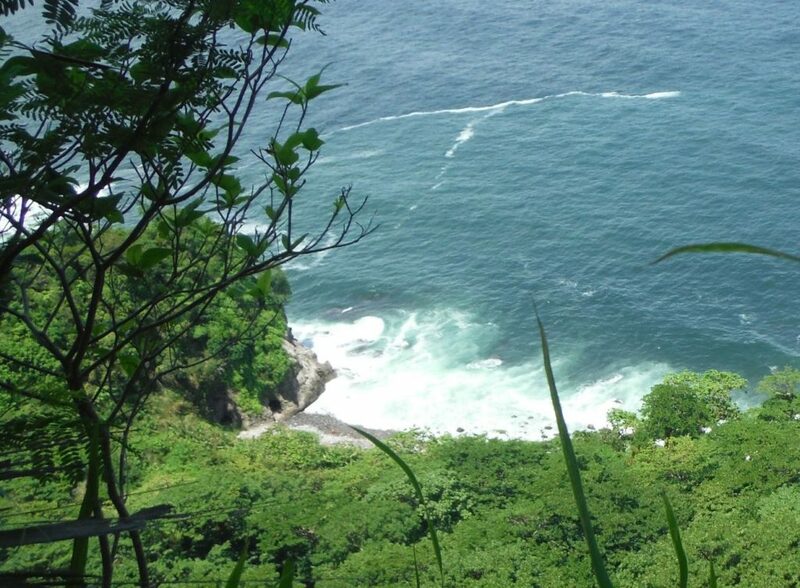 0ne of three images of my walk from Bottomside up to Battery Cheney on Corregidor Island, the former Fort Mills in WWII, 2018-07-06, this is the shoreline between Wheeler and Searchlight Points. Zc419. 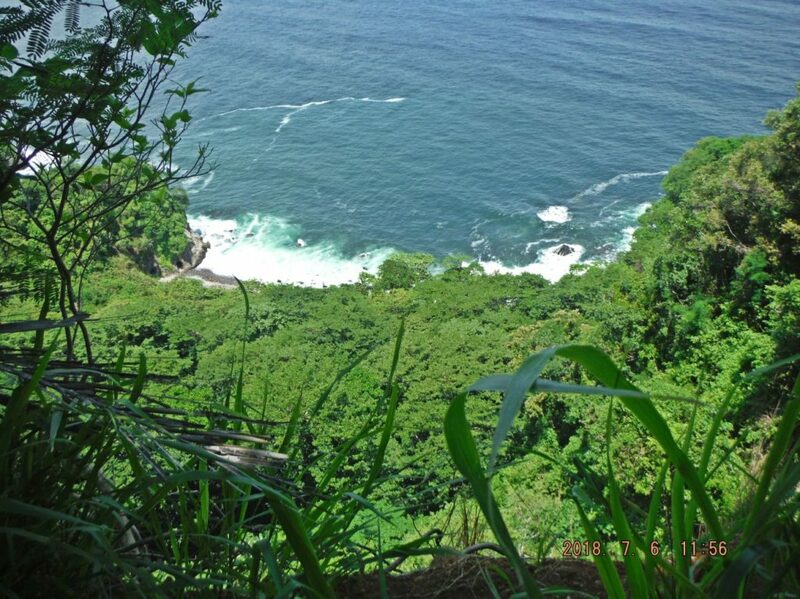 0ne of three images of my walk from Bottomside up to Battery Cheney on Corregidor Island, the former Fort Mills in WWII, 2018-07-06, this is the shoreline between Wheeler and Searchlight Points. Zc420. 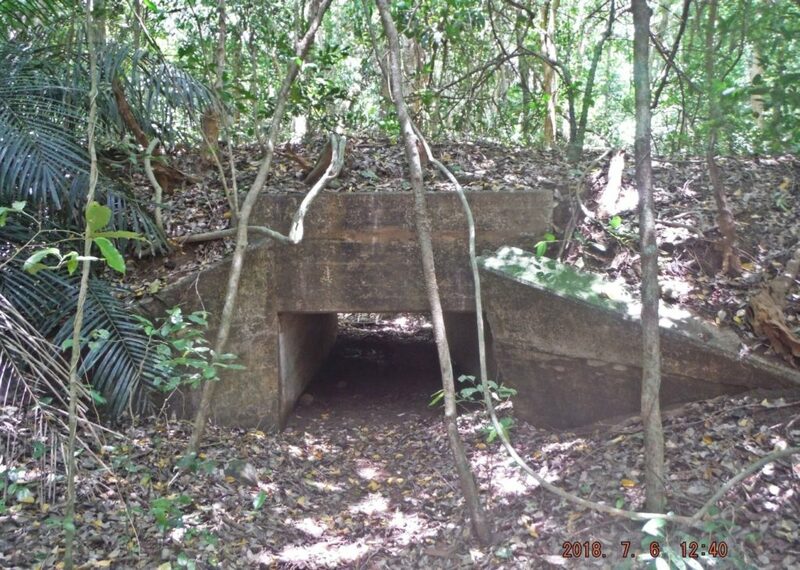 0ne of six images of my walk from Bottomside up to Battery Cheney on Corregidor Island, the former Fort Mills in WWII, 2018-07-06, this is Battery Cheney. Zc421. 0ne of six images of my walk from Bottomside up to Battery Cheney on Corregidor Island, the former Fort Mills in WWII, 2018-07-06, this is Battery Cheney. Zc422. 0ne of six images of my walk from Bottomside up to Battery Cheney on Corregidor Island, the former Fort Mills in WWII, 2018-07-06, this is Battery Cheney. Zc423. 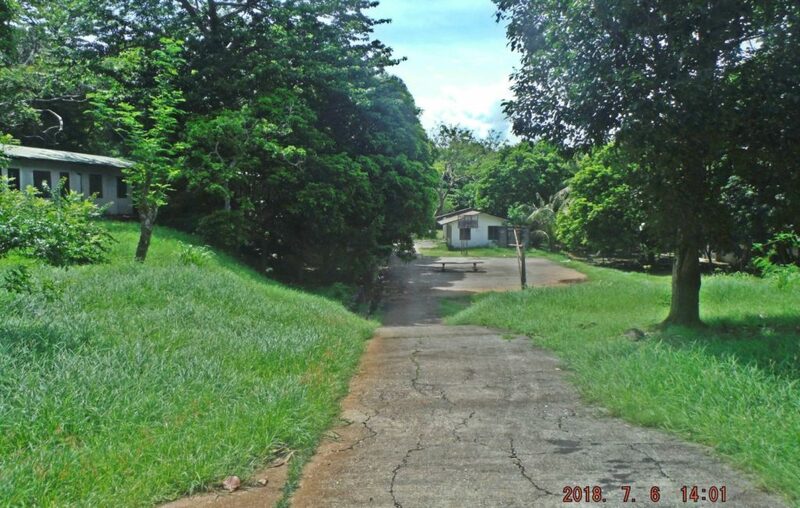 0ne of six images of my walk from Bottomside up to Battery Cheney on Corregidor Island, the former Fort Mills in WWII, 2018-07-06, this is Battery Cheney. Zc424. 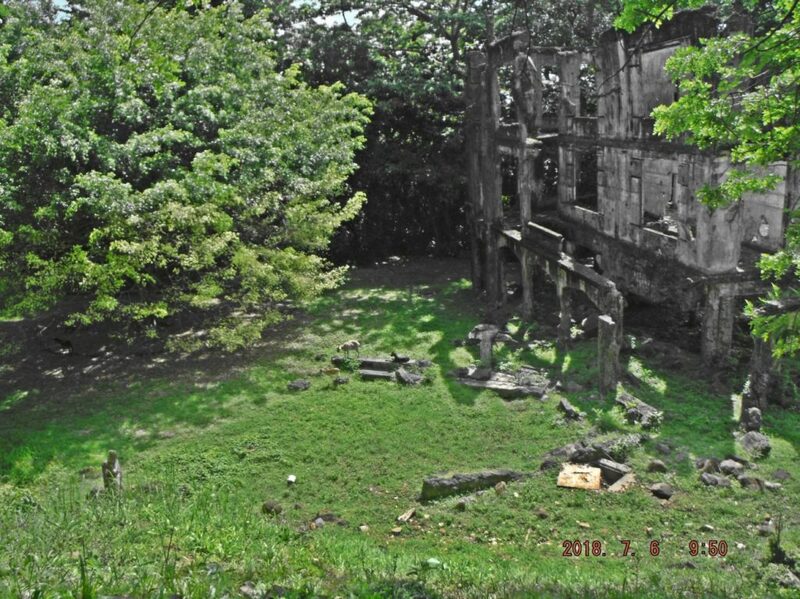 0ne of six images of my walk from Bottomside up to Battery Cheney on Corregidor Island, the former Fort Mills in WWII, 2018-07-06, this is Battery Cheney. Zc425. 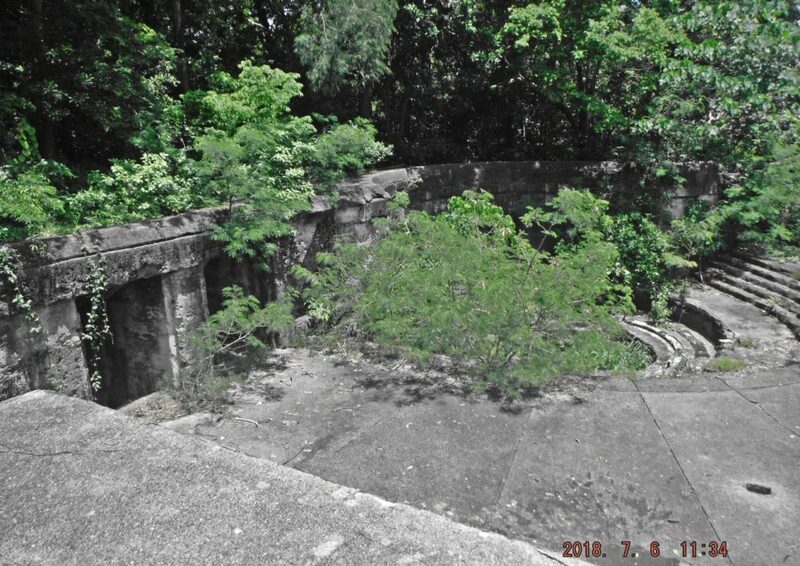 0ne of six images of my walk from Bottomside up to Battery Cheney on Corregidor Island, the former Fort Mills in WWII, 2018-07-06, this is Battery Cheney. Zc426. 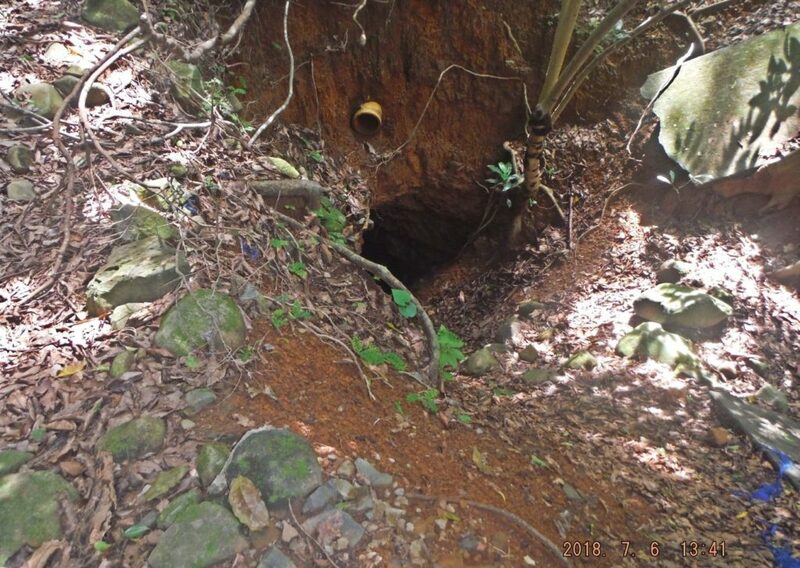 0ne of four images of my walk from Battery Cheney down to Bottomside on Corregidor Island, the former Fort Mills in WWII, 2018-07-06, this is along the Battery Cheney rail track, a large culvert. Zc427. 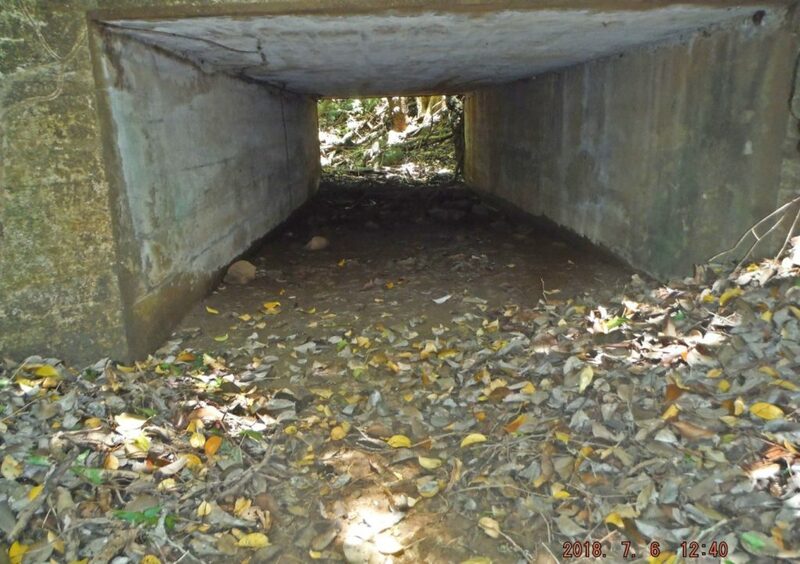 0ne of four images of my walk from Battery Cheney down to Bottomside on Corregidor Island, the former Fort Mills in WWII, 2018-07-06, this is along the Battery Cheney rail track, a large culvert. Zc428. 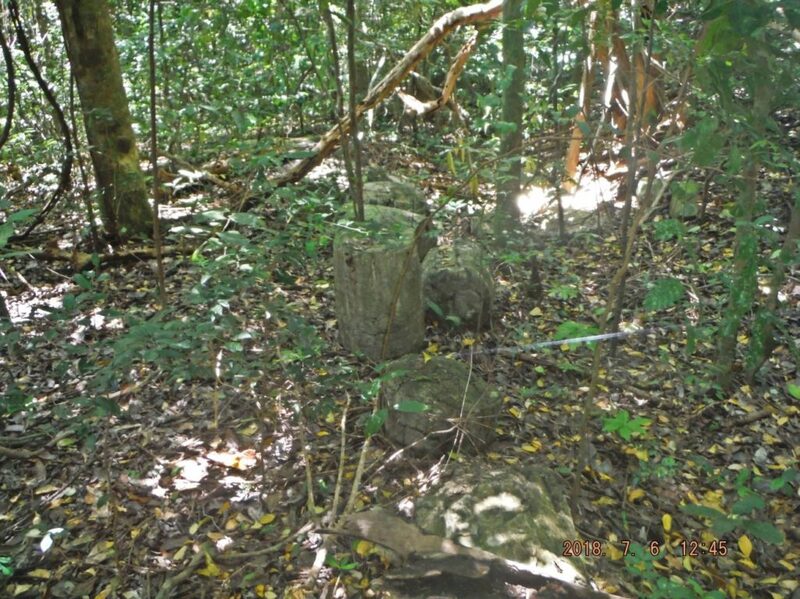 0ne of four images of my walk from Battery Cheney down to Bottomside on Corregidor Island, the former Fort Mills in WWII, 2018-07-06, this is along the Battery Cheney rail track, unknown column blocks. Zc429. 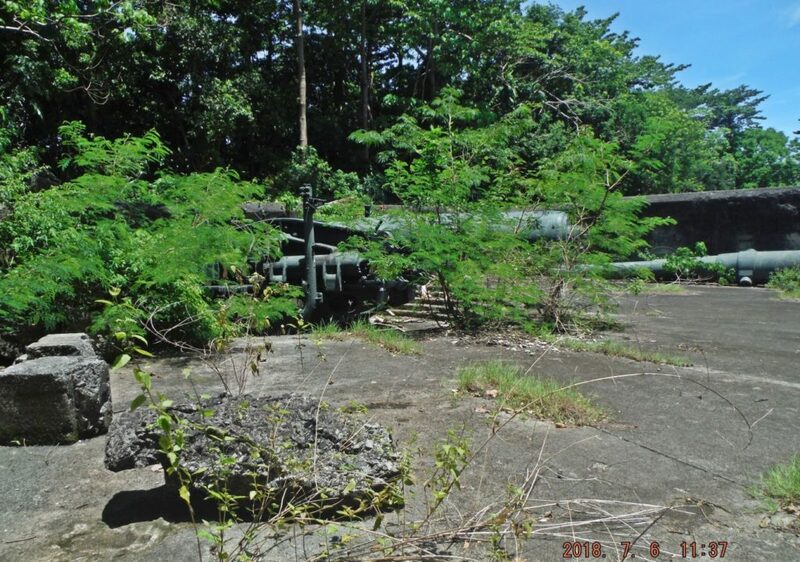 0ne of four images of my walk from Battery Cheney down to Bottomside on Corregidor Island, the former Fort Mills in WWII, 2018-07-06, this is along the Battery Cheney rail track, that massive magazine building. Zc430. 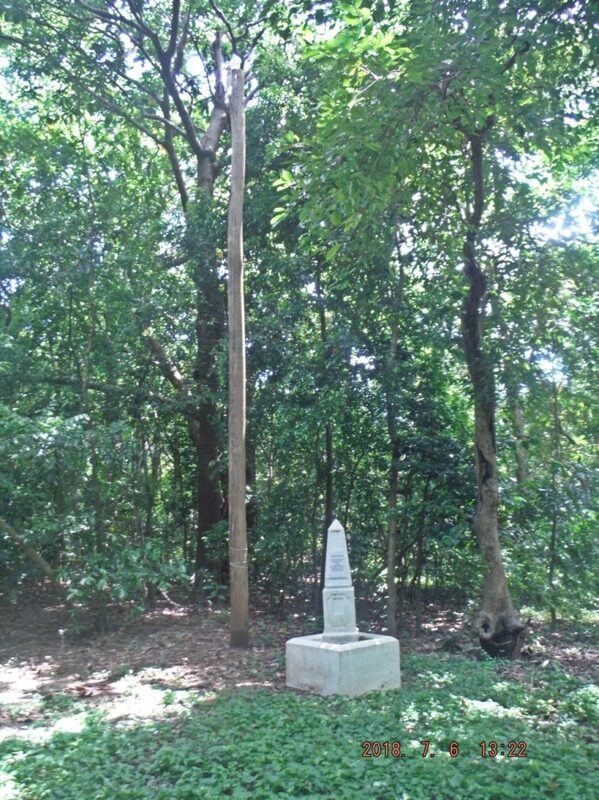 0ne of four images of my walk from Battery Cheney down to Bottomside on Corregidor Island, the former Fort Mills in WWII, 2018-07-06, I found the 50 Star U.S. flag still flying at the PIR 503d First Flag marker, I turned it in. Zc431. 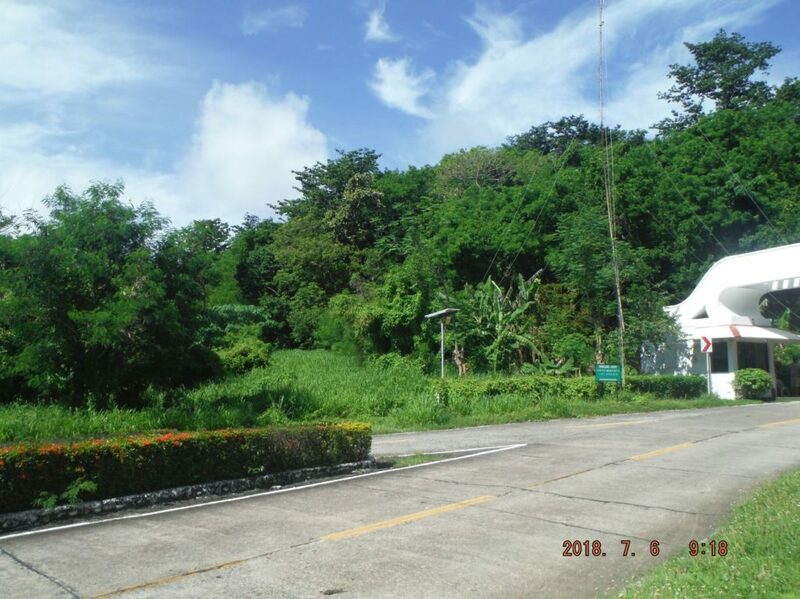 0ne of four images of my walk from Battery Cheney down to Bottomside on Corregidor Island, the former Fort Mills in WWII, 2018-07-06, I found the 50 Star U.S. flag still flying at the PIR 503d First Flag marker, I turned it in, it was still clean and not damaged. 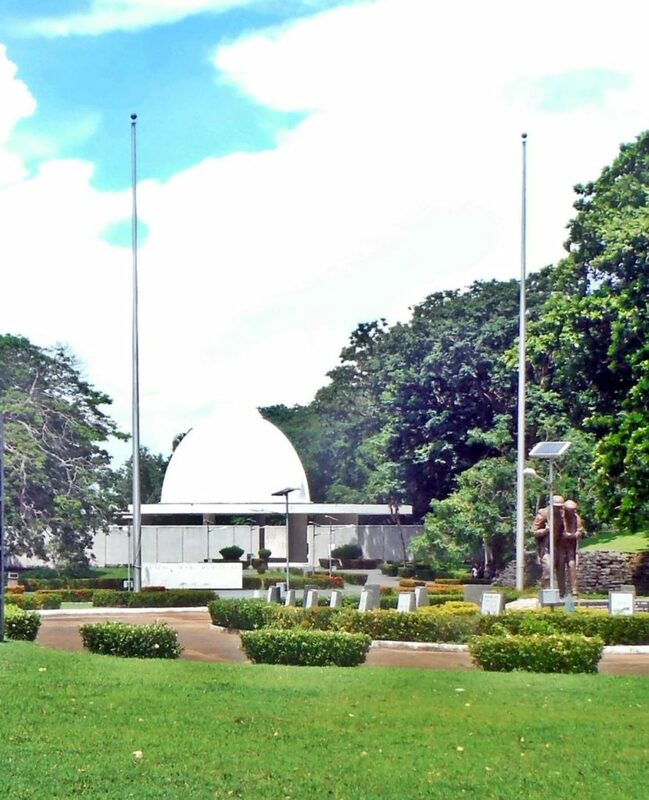 There were only two flags flying this day on Corregidor, the Philippine Flag in front of the CFI Admin Building at Bottomside and the U. S. Flag at the First Flag of Liberation of the 16th Feb. 1945. On my two day visit all the other flags were not hoisted, like at the Pacific War Memorial. Zc432. 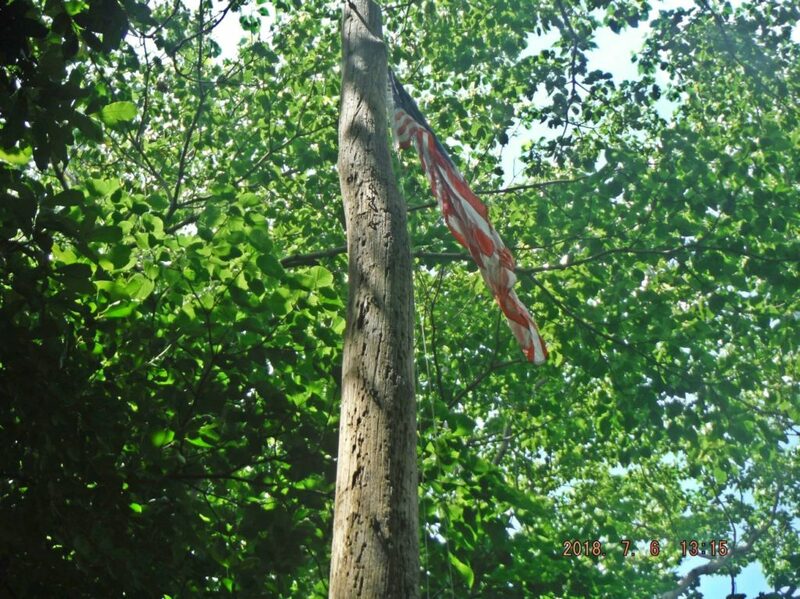 0ne of four images of my walk from Battery Cheney down to Bottomside on Corregidor Island, the former Fort Mills in WWII, 2018-07-06, I found the 50 Star U.S. flag still flying at the PIR 503d First Flag marker, I turned it in. I don’t how long it was flying, maybe it was hoisted for my visit? But the flag was clean and intact. Zc433. 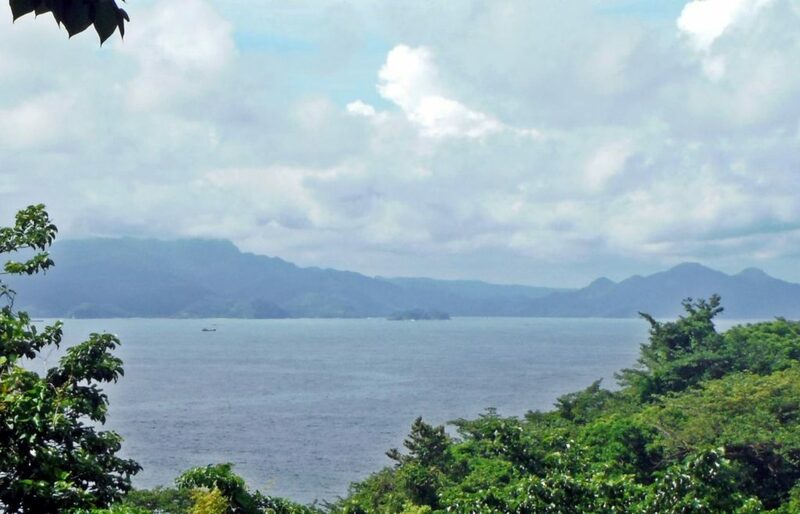 0ne of four images of my walk from Battery Cheney down to Bottomside on Corregidor Island, the former Fort Mills in WWII, 2018-07-06, I found the 50 Star U.S. flag still flying at the PIR 503d First Flag marker. As I said, I turned it in. Zc434. 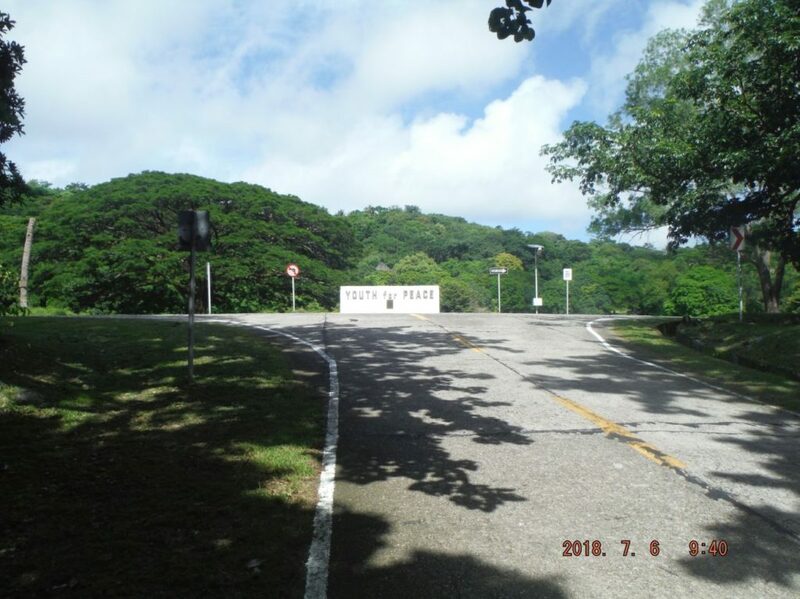 0n my walk from Battery Cheney down to Bottomside on Corregidor Island, the former Fort Mills in WWII, 2018-07-06, I checked on the entrance to the large Middleside Tunnel. It is still open but I don’t like to enter most tunnels anymore without a partner. Zc435. 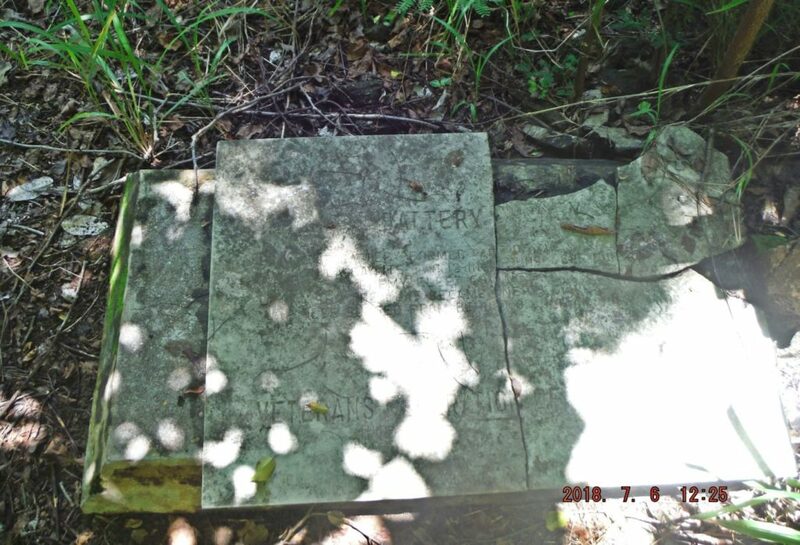 0ne of two images of my walk from Battery Cheney down to Bottomside on Corregidor Island, the former Fort Mills in WWII, 2018-07-06, this is the Stockade Level, the 4th Marines school plaques are still there on the wall. Zc436. 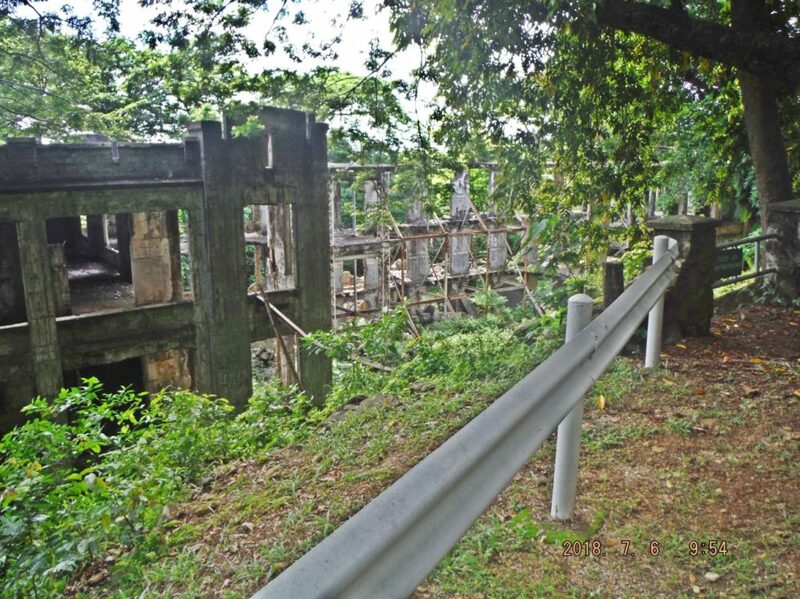 0ne of two images of my walk from Battery Cheney down to Bottomside on Corregidor Island, the former Fort Mills in WWII, 2018-07-06, this is the Stockade Level, the Rowhouse is left and straight ahead is a CFI utility bldg. Not visible, at right is another row-house like structure where the CFI personnel and others are quartered. I believe, under the new CFI management all have to pay some rental fee now. Zc437. 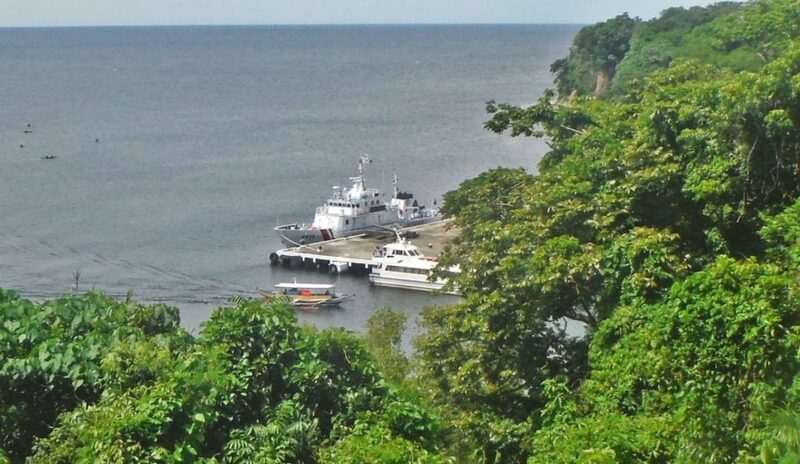 0ne of five images of my walk from Battery Cheney down to Bottomside on Corregidor Island, the former Fort Mills in WWII, 2018-07-06, we see the busy North Dock area. Zc438. 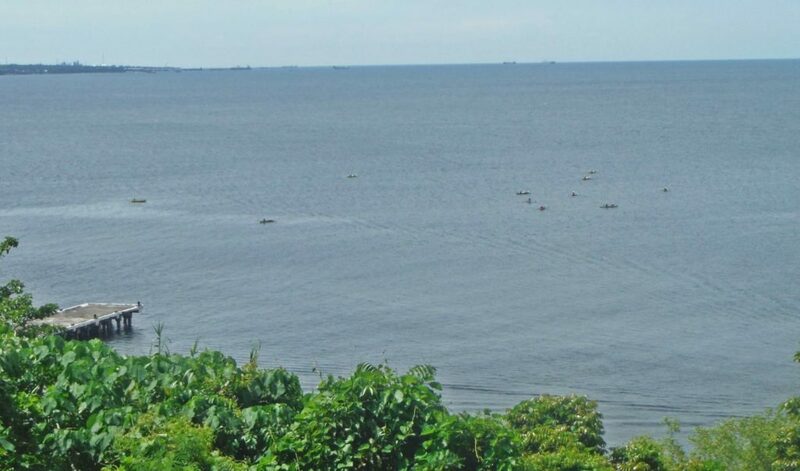 0ne of five images of my walk from Battery Cheney down to Bottomside on Corregidor Island, the former Fort Mills in WWII, 2018-07-06, the waters off the north shore are calm and the local fishermen are out. Because of the SW Monsoons it is very calm at this side. There were SW ocean swell rolling in on the other side. Zc439. 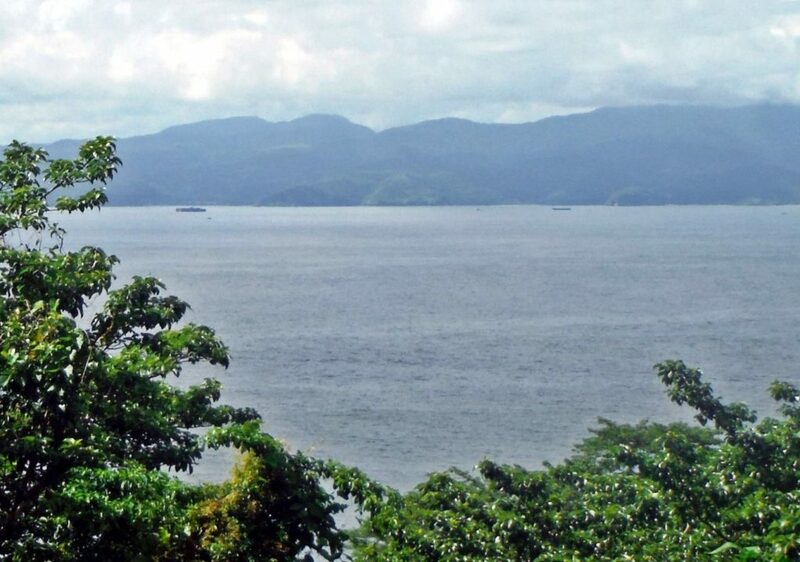 0ne of five images of my walk from Battery Cheney down to Bottomside on Corregidor Island, the former Fort Mills in WWII, 2018-07-06, Malinta Hill and the Corregidor Inn are in sight. Zc440. 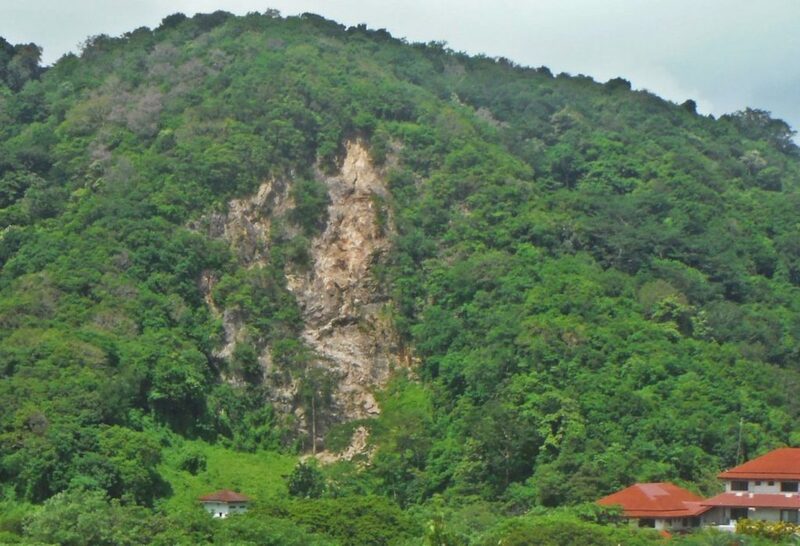 0ne of five images of my walk from Battery Cheney down to Bottomside on Corregidor Island, the former Fort Mills in WWII, 2018-07-06, Malinta Hill had a recent rockslide from above the west entrance to the Malinta Hill Tunnel. A resident told me it was about 5 truckloads of debris. Zc441. 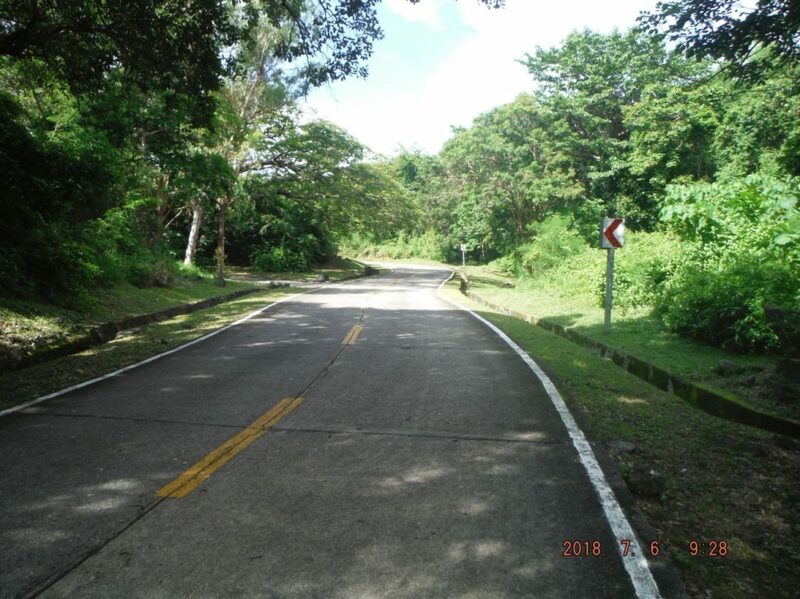 0n my walk from Battery Cheney down to Bottomside on Corregidor Island, the former Fort Mills in WWII, 2018-07-06, this is the 3rd time today that I came across the street maintenance crew, very good!